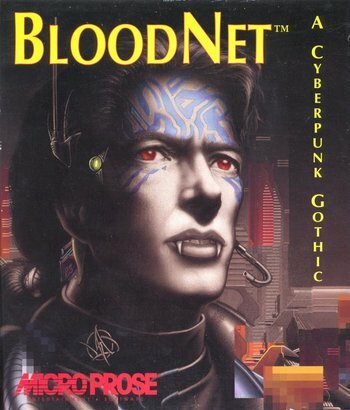 A gothic, cyberpunk graphical adventure with RPG elements from 1993. Blends vampires and William Gibson surprisingly well. You must gather a party and find a way to free yourself of the curse before the chip is overwhelmed. Jerry-rigging flamethrowers or Bio-Tech sounds great in theory, but the tendency for jury-rig weapons to explode makes them extremely dangerous (and disarms the user!) that the player is better off with a Shotgun - which does more damage then the flamethrower. Nimrod 7 is one of the most powerful NPCs you can have join your party. He is also a prolific and well-known assassin with no scruples about who he works for, and as a result he is hated by about half of everyone you meet. Some refuse to join you with him in the party, others will attack you outright. Aerith and Bob: Hanging out on scenic 175th Street are Phracktle K. Oss, Auntie Matter, Phree Thaught, Nai Hillistick and Chuck. Cybernetics Eat Your Soul: Ransom Stark and streetgangs frequently argue about whether cybernetic implants destroy or enhance the user's humanity. A number of characters have had their brains fried by a combination of designer drugs and cybernetic implants -it is set in the futuristic New York ghettos and the modifications are typically illegal and unmoderated - but a cybernetic implant is helping to prevent the main character becoming a vampire and others are being used to cure a variety of mental illnesses. So, it's a combination of this trope and A.I. Is a Crapshoot. Dummied Out: Several items and skills mentioned in the manual are either no where to be seen (such as higher levels of Cyberlegs), or just not implemented properly such as lock-picking and medicinal. Gainax Ending: The ending feels cobbled together from fragments of plot that were meant to be larger things. Obvious Beta: The sheer amount of dummied-out content indicates how unfinished this game was. Point-and-Click Map: It has a map of New York with several markers on it, with more appearing as the game progresses; clicking on a marker brings up a list of all the locations in that area. Sycophantic Servant: Renfield. He really loves serving vampires, even when they dislike other vampires and just want a cure, he'll still kiss up while following orders. The Corruption: Ransom Stark has an instant-kill bite attack, but each use of it decreases his humanity a little and brings him closer to the Nonstandard Game Over (in addition to the normal decrease of his humanity with time). The Renfield: The aptly named Renfield's purpose in life is to serve vampires. Timed Mission: You have only a few in-game days to find a cure to your vampirism or the implant will burn out, leaving you as a monster. Unwinnable by Design: Nimrod 7 has angered many of the gangs in the city through his choice of employers. Recruiting him means several characters will go hostile on sight, which makes the game impossible to finish as you must peacefully talk to them in order to gain access to key locations. There's also the fact that despite needing to sate your Bloodlust, you can use the instant-kill bite on any NPC. Including plot important ones. And there's absolutely no indication of who's plot important, making it all too easy to drain someone and screw your game without knowing until it's too late. Vampire Refugee: Ransom Stark's choice is to find a cure or lose himself to the thirst. Vampires Sleep in Coffins: Vampiric party members can only rest in a coffin (actually a sarcophagus you steal from the museum) lined with dirt from their home. Viewers Are Geniuses: Numerous references to Franz Kafka and Friedrich Nietzsche throughout the story.